A forced two week taper…. With two weeks before Boston I am in a forced taper. B Last week I managed to get 75 miles in while this week I’m at mile 26. B Working 12-13 hours a day doesn’t leave much for a 10-miler. B I’ve tried but running at 9PM on a treadmill is not worth it to me. B I’m hoping to hit 50 for the week with a final 20 milers on Saturday and then justB ellipticalling (yes, that’s a word, deal with it)B the final week before Boston. B We’ll see. 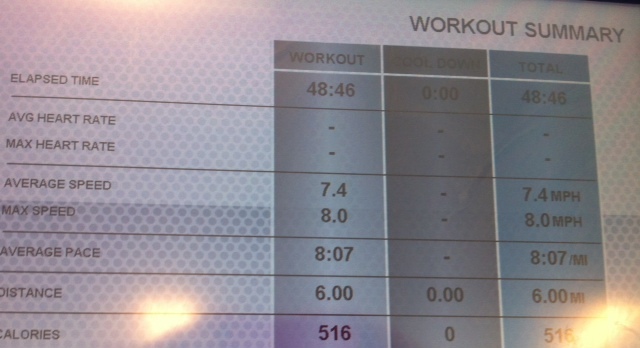 Since I couldn’t get in any post work runs, I tried to really focus on my 6-milers. B Even when I wanted to take it easy, I tried to push myself. B I have a half marathon in May and I’m eyeballing a 1:35 finish, we’ll see. B Its in Gloucester, MA and I’ve never been there and I don’t know how the elevation and route will be. Part of me is hoping for rolling hills since I really enjoy those. B I love the struggle upward and sprinting downhill. B It’sB exhilarating! Monday – No run didn’t get home until 11PM but I had a pretty sweat work dinner. B Yes, its easy to keep me happy, just feed me. B I guess employers figured that out. Tuesday I had enough of not moving from my desk for 14 hours and sneaked in a 6 miler during lunch. B Good thing I don’t care about things like doing my hair and thank god for dry shampoo. Although this was on incline 3 and average pace of 7, I felt a little disappointed that the run didn’t feel any easier after not running Monday. B Luckily myB Wednesday run wentB smoother. 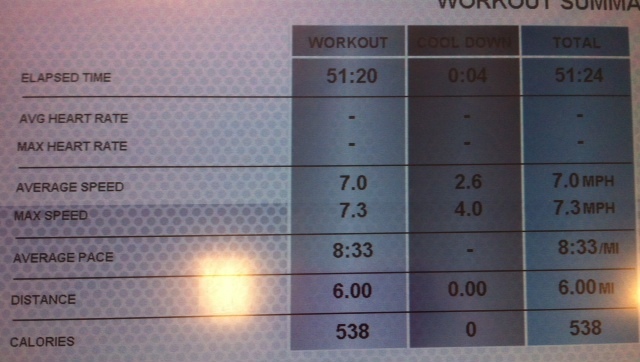 B I dropped the incline to 2 and played around with intervals a bit. B The first mile I did at 7:30 pace and kept slowing down afterwards. 7.4 average pace! B I’ll take it. B I knew this week wasn’t going to be about miles so instead I tried my hardest to focus on pace without giving up the extra challenge of a mild incline. 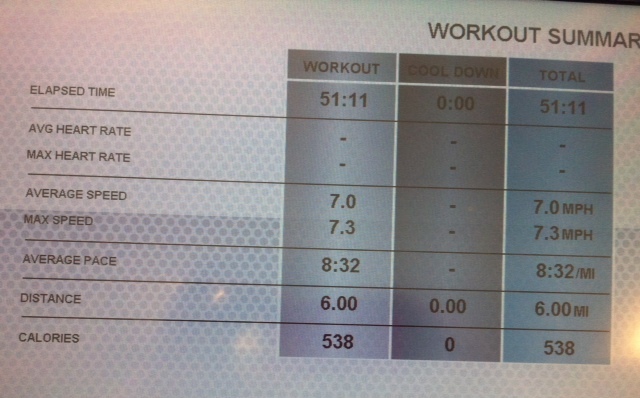 B Part of me is stubborn with inclines on treadmills so that i can enjoy running outside a lot more. B It feels easier and the added distraction of scenery makes running outside so much more enjoyable! 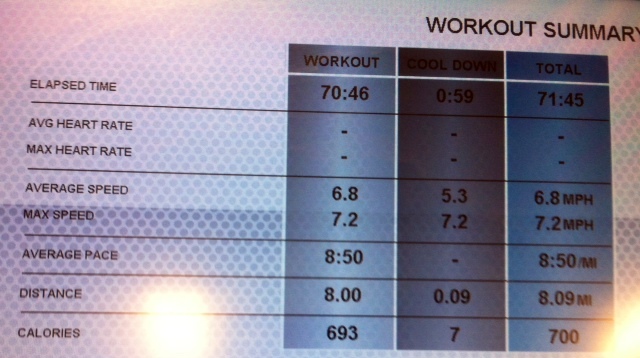 B Treadmill runs are not there for fun, they’re there for training. B I’ve drilled that into myself. By Thursday I really wanted to take it easy. B I was still sneaking in a lunch time running thinking it will be another late night. B I kept it on incline 3 and although it wasn’t as strong as Tuesday and I had more walk breaks then I walked to, I pushed myself on the running part. B I guess it was a more mild interval run vs a more steady tempo run on Tuesday but the end result was only off by 9 seconds. 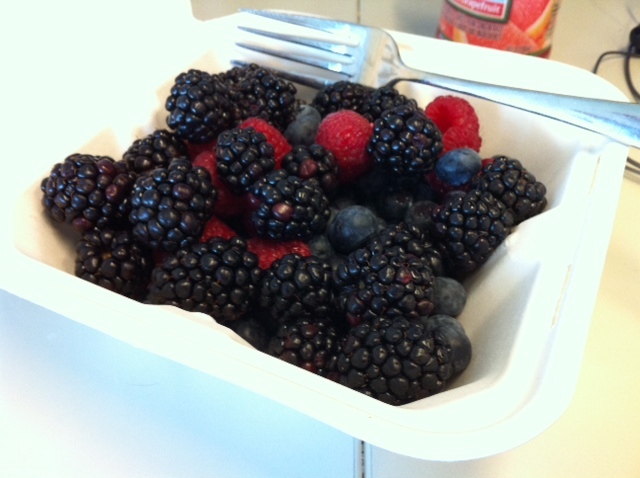 I also decided I was going to be a bear and graze on berries after my regular 3 cups of Oatmeal breakfast. B I think I reached a new max of how many berries I can fit in these little containers. Plus they had all my favorites this morning. B SeriouslyB employers, the way to your employee’s heart is really through their stomachs. 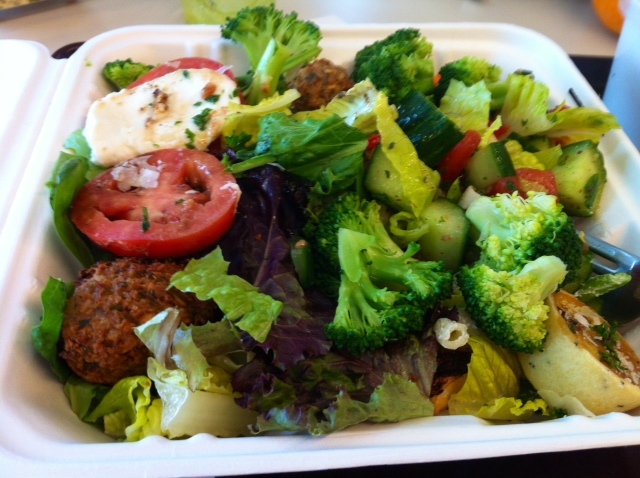 I followed the same for lunch by maxing out a larger container. Mnn falafal!! B There’s grilled chicken in there as well, but I put it underneath and usually save it for Tony. B I’m such a nice girlfriend. B I make sure he’s fed, even if I can’t cook. I got surprised today when my team finished up our busy things at work and I was able to leave work before sunset! B So of course I used this opportunity to log some extra post work miles. B 8 miles to be exact for a total of 26 for the week. B If I can manage to get in 4 tomorrow before my flight to NY, all I’ll have left is the 20 miler. I didn’t really have a purpose in this run other than just to get it done before 7pm so I can go home and eat dinner, blog, pack and clean. While my teeth might disagree, I always have made theB argumentB that my chocolateB addictionB is aB perfectlyB acceptable healthy diet. No, I have no idea what my mom is wearing. B I stopped trying to figure out her outfits a while ago. I do get to play with this guy! That Rocky, my parent’s dog/kids replacer. Of course he can’t replace my boy Jack but he sure shows his affection better. 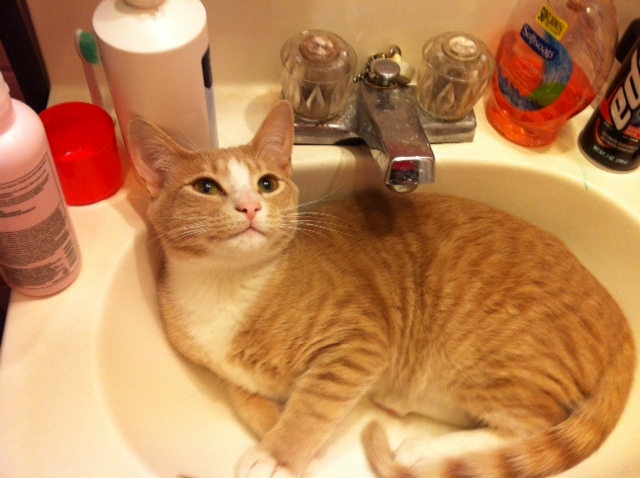 Yes, leave it to a cat to give you a dirty look for when you try to brush your teeth in the morning. Any good plans this weekend? Any good taper week tips? Good luck with the marathon! Plans this weekend? 10 Miles. Plans? 3 on Saturday, 8 on Sunday. Taper, taper, taper! Have a great weekend!! Hope they’re both happy runs :).thank you! Love the name of your blog and the kitty in the sink. Mine loves that too. Best of luck in Boston! Thanks! He secret just wants a swim! Plans… Clare Madventure? “Ireland toughest marathon” according to the website, we’ll see about that…..
Oo good luck!!! That sounds like a lot of fun!